Austrian cantor and composer; born at Hohenems, Tyrol, March 30, 1804; died at Vienna Jan. 17, 1890. His family, which prior to 1813 bore the name of Loewy, removed to Hohenems from Sulz in 1748. He was educated for the cantorate, studying first under the cantors of Endingen (Switzerland) and Carlsruhe, with whom he traveled extensively, and later under Salomon Eichberg, cantor at Hohenems and Düsseldorf. In 1820 Sulzer was appointed cantor at Hohenems, where he modernized the ritual, and introduced a choir. At the instance of Rabbi Mannheimer of Vienna he was called to the Austrian capital as chief cantor in 1826. There he reorganized the song service of the synagogue, retaining the traditional chants and melodies, but harmonizing them in accordance with modern views. Sulzer's "Shir Ẓiyyon" (2 vols., Vienna, 1840-65) established models for the various sections of the musical service—the recitative of the cantor, the choral of the choir, and the responses of the congregation—and it contained music for Sabbaths, festivals, weddings, and funerals which has been introduced into nearly all the synagogues of the world. In the compilation of this work he was assisted by some of the best musical composers of Vienna. Sulzer published also a small volume of songs for the Sabbath-school, entitled "Duda'im"; and a number of separate compositions, both secular and sacred. His responses are tuneful, and though more melodious than the choral chant of the Catholic Church, show a strong resemblance to it. In all his compositions strict attention is paid to the Hebrew text; and a scrupulous adherence to syntactic construction is observed throughout. The collection "Zwanzig Gesänge für den Israelitischen Gottesdienst" (Vienna, 1892) was printed posthumously. In his "Denkschrift an die Wiener Cultusgemeinde" he sums up his ideas on the profession of cantor. 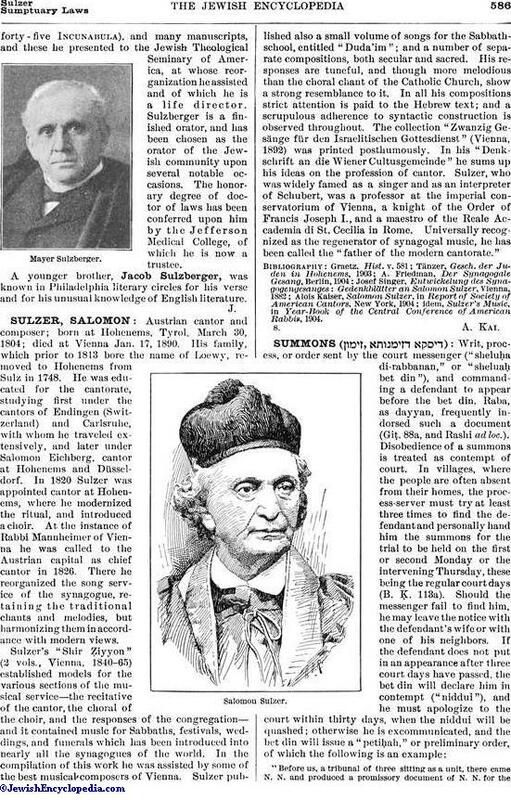 Sulzer, who was widely famed as a singer and as an interpreter of Schubert, was a professor at the imperial conservatorium of Vienna, a knight of the Order of Francis Joseph I., and a maestro of the Reale Accademia di St. Cecilia in Rome. Universally recognized as the regenerator of synagogal music, he has been called the "father of the modern cantorate." idem, Sulzer's Music, in Year-Book of the Central Conference of American Rabbis, 1904.